Whenever I hear the call for an Arborio-rice risotto, I’m fully aware of the work involved: the dedicated, diligent mixing. But I also know that the payoff should be the fully rewarding scent of white wine and cheese as they integrate into the mix, not to mention the creamy meal to follow. 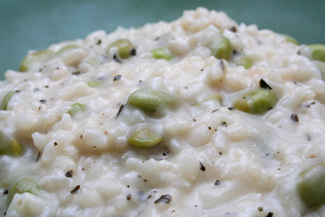 The “Creamy Edamame Risotto,” from All Recipes, asked to use frozen shelled edamame, which I found to be enticing. I customized the recipe to yield 4 servings, so a single 14-oz. bag of frozen Seapoint Farms edamame provided the necessary 3 cups. I cooked these shelled soybeans for 6 minutes. It was interesting to use garlic powder, rather than the “real thing.” It did produce a great garlic scent as I stirred. I simmered my cup of wine for 1 minute; it was a 2007 Italian Gavi. My three installments of hot water were 2 2/3 cups each. I stirred the first installment for 15 minutes; the second for 17 minutes; the third for 17 minutes. As you stir a risotto (hopefully while sipping a bit of that same white wine that you’re using in the mix), you realize that this is a meal that demands the respect of your diners. It’s a luscious and thoughtful meal that gives back whatever effort you put into it. The creamy texture of the goat cheese is such a great finale of richness, such a pleasure as you stir. I added 2 1/2 tsp. salt and 1/2 tsp. black pepper to this risotto. My young child liked it -- the creamy appeal transcends generations -- and a little definitely goes a long way. If you dare(!) to involve edamame in your lifestyle, then make this risotto and dazzle yourself with the triumph of this meal. Next time, I want to make the “Salmon Cakes with Lemon Yogurt Sauce,” from the August 2008 issue of Gourmet, along with the “Green Bean and Potato Salad,” from Allrecipes.com. I hope it’s a good, solid meal. Come back to my site on Monday, December 1, to see what happens.